I have been privileged to have lived in two of the most productive eco-systems in Africa. For seventeen years I followed and filmed the great migration of bearded wildebeest from the Serengeti in Tanzania into the Masai Mara in Kenya. 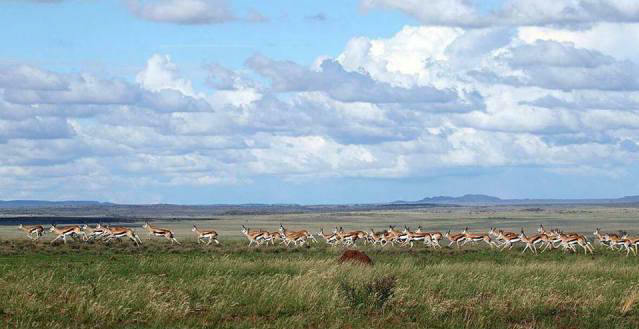 For 18 years I have lived in the Great Karoo of South Africa which once supported an incredible 200 million springbuck. Today the Serengeti - Masia Mara eco-system operates as it has done for thousands of years. The land through the grass, bushes and trees feeds the animals and the animals through their dung and urine, feed the land. In short, this symbiotic relationship is a self-perpetuating system which has produced some of the most productive eco-systems the world has ever known. Sixty two million American buffalo in the prairies of North America, two to three hundred million springbuck in the Savannah grassland of South Africa, to name a few. Sadly, in the Karoo of South Africa, at the turn of the previous century, man destroyed the symbiotic relationship between the land and the animals. 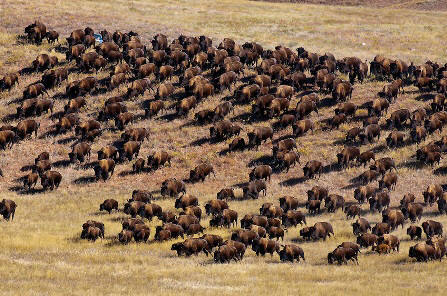 The huge number of Buffalo in North America and the great herds of springbuck survived because of their mobility. In short, they grazed the grass, fertilized the soil and moved on, repeating the process over and over again. It is interesting that American Buffalo (Bison), Wildebeest and Springbuck are all designed to move long distances. However, in South Africa and the USA, the ability to move was destroyed with the advent of the wire fence. Once people were given title to the land, these great eco-systems that had been so productive were destroyed. Humans are extremely territorial animals. “This is my farm, this is my boundary and these are my animals” is the mantra of every farmer world wide. “Those who compete with me shall be destroyed with gun, trap and poison”, is another farmers mantra. Therefore the Lion, Leopard, Caracal, Jackal, Cheetah, Wild dog and Hyena in Africa, the Mountain Lion, Wolf and Coyote in the USA are all listed as vermin to be killed as soon as they pose a threat to livestock. However, when one alters an eco-system there is cause and effect. There are repercussions! Under the migratory system the animals impacted the land in a symbiotic relationship and moved on. In the farming regime, the indigenous animals have been replaced by exotic animals (animals that can be easily domesticated and which put on weight fast.) However, the exotic animals are not designed to move great distances. Even if they were mobile, there are fences in the way. Now the domestic animals have to survive for 365 days a year on the farm. The farmer provides water for the livestock in the form of windmills pumping out the boreholes. Every day the livestock move to the water, overgrazing and denuding the land around the windmill. The process is called “desertification” an ugly word for an ugly process. In the symbiotic migratory regime, the rain that fell remained in the system, under desertification, the rain is lost to the system, further impoverishing the land. However, worse news is to follow. Scientists have linked desertification (2/3 of the earth’s surface is affected by desertification) as one of the major causes of climate change. 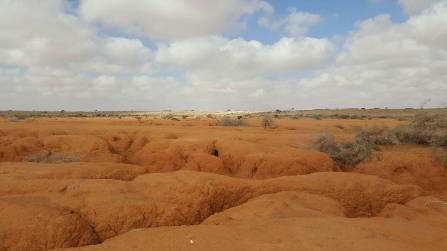 Some scientists believe that desertification is a bigger cause of climate change than indeed the burning of fossil fuels. In my previous Newsletter, I talked of the ecological blunder human beings have committed, in destroying the diversity of plants in the deforestation of the earth. Desertification could be an even greater miscalculation than deforestation, because like the forest destroyed, how do you reverse desertification. One thing patently obvious, is that we had no understanding of the complex workings of the 62 million American Buffalo which moved across the North American prairies and we had no idea on how the land in the Karoo of South Africa supported over 200 million springbuck and other species. What is becoming clear is that our farming systems across the globe and hence our food supplies are going to be ruthlessly exposed by flood, fire, drought, disease and everything Goddess Gaia will throw at us under the guise of climate change. On a personal note, the Masai Mara where I spent 17 years of my life, has now given title deed to the Masai people who live in and around the Masia Mara. This is a blunder of tragic proportions, for like the fenced farms in the Karoo, they are setting themselves up for desertification on a massive scale. The disastrous mistakes made in the Karoo of South Africa have not been heeded. Thank you for all your replies to "Response to letter from Elayna Kinley" and "Supermarket Shopper vs. Hunter Gatherer". Once again I apologize for not being able to answer them all personally. "JV's response to letter from Elayna Kinley"
I would like to thank you again for having Darren and myself at the Tiger Canyons and the incredible experience you gave us. It was the most incredible thing we have ever experienced and worth every penny. With regards to this lady's email, I would like to make a few comments about it myself. Firstly she seems to be very aggressive, almost abusive in her email, it's like she has absolutely no idea what is really going on at Tiger Canyons. Investing in an animal seems like her way of getting information out of you, using money to get it. Updating the website is not a bad idea, I would also love to see a family tree of the Tigers as more are born. However, having an updated list of each tiger and each of their characteristics is dangerous. For example, Panna, she is shy, sweet tigress, now you go and advertise that on the website with how large her territory is, kills etc, and you are basically giving poachers a beautiful outline of her so making her easier to track down and poach. I would seriously err on the side of caution when giving information about the tigers. Honestly, I think the emails are more than enough to get news on Tiger Canyons. Maybe your website can have a search function, that if someone wants to look up a certain Tiger. For example, we saw Tibo, Sunderban and Panna with her cubs, I would love to be able to search them on your website to see if there is any news on each of them and it just comes up with the newsletters where they are mentioned. But I think more than that and a family tree is taking a risk. Unfortunately in this day and age, we have to think of humanity as opportunists, and protect the animals in our care. You can maybe have different ways that people can donate money of ways to help. I don't know if you have a volunteer program? Or if that is even possible. Having a little curio shop with printed T-shirts, caps, key rings, etc, your usual paraphernalia you find in tourist places. They fairly cheap to have done and can be sold at a decent price to bring more money into the Tiger Canyons. I know I would buy a T-shirt with a photo of Panna and her cubs without a second thought. Just some ideas that may help financially. It would seem that Elayna Kinley does not know you like I do. I have followed your work through television documentaries for many years and I can't believe that you would do what you do with out having done a lot of research into the breeds of big cats and therefore knowing all the risks of what inbreeding. I hold my hands up and can honestly say I don't know al about your work, but I am sure that you would not do anything that would be detrimental to the well being of the cats in your charge. I would like to know if you have any plans to relocate some of your tigers back to their home countries in India and Asia, as I am a member of the WWF and the Save the Tiger Campaign to help increase the number of tigers to double the current wild populations and I believe that you could help by relocating the related Cubs you have and rather make them sterile relocate to India and Asia. John, I love your response. I have never had the privilege of meeting you and would do anything to visit Tiger Canyon just once in my life. I support what you and other conservationist do to save our animal species from the hands of greedy ignorant human beings. I do sit behind my computer in the UK where I now live and watch live streams from the Greater Kruger National Park. I read many blogs and keep up with what is going on in SA. It’s what I can do to keep close to my home and close to something very dear to my heart. I have great respect for people like you who make it their life’s ambition to make sure that these beautiful creatures are around for many many years to come. I certainly want to be able to visit the bush and admire these amazing animals for the rest of my life and I want my children’s children and all the generations to come be able to experience what I have seen in my life. I would like to thank you and all who work with you for actually getting up and making an effort to conserving these beautiful animals. I know I can thank you on behalf of my whole family as well. "The Supermarket Shopper vs. The Hunter Gatherer"
John, I am afraid you are too late. There is no going back from where we are now. There is simply at least 4 billion people too many. You can't cull them. Only war or natural disaster can do that. What will that bunch in New York called the United Nations do? Nothing of course which is pretty much what they have done for 70 years except soak up money. Mother Earth is in a bad place right now and we can only tinker around the edges and feed and shelter people living in war zones, famine affected countries and in areas where exotic diseases have broken out. where does leave our wildlife? it leaves them with a limited life span as a earthly species. Where does it leave us humans? In the same place as our beautiful wildlife. So why do you use plastic bags?? There are boxes, you can buy bags made by the locals etc. So why do you buy this terrible meat? To please paying guests?? What about vegetarian food? There is NO excuse to buy and use those things, and every single person can change its own habit. I am forwarding a copy of what the local government in Cape town is planning and about to do……. Lets push more local governments to do like wise. It’s a start. At the Western Cape DA’s Provincial Congress on Saturday, my motion regarding the reduction of plastic shopping bag waste in the province was passed. Plastic bag wastage has a devastating effect on the environment, posing a danger to humans and wildlife. We need to deal with environmental issues in the same way we deal with people's issues as you cannot disconnect the one from the other. This motion serves to highlight the importance of taking care of the environment because it is essential to human survival. Just finished your piece on the Hunter-Gatherer versus the Supermarket Shopper and was very impressed. I've even heard it said that the development of "monoculture" crops was really the first Environmental insult visited on our Planet and I am now inclined to agree. 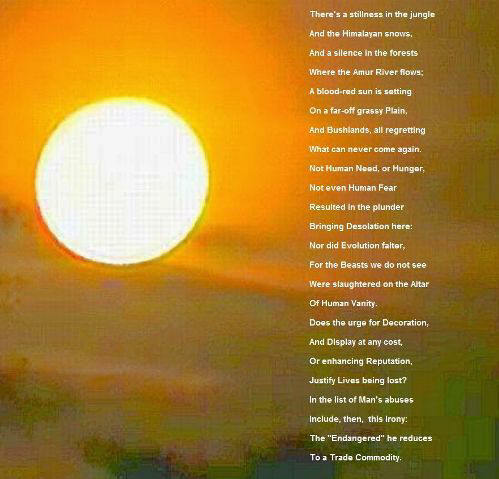 On the subject of exploitation and conservation I am including a poem I wrote a couple of years ago. I hope you like it! Ian and I are still in awe after our wondrous visit with you last week!!!! It was just an unforgettable experience once again. Thank you for your time and for the way you shared your vast knowledge and love for these majestic animals with us. The work you do is unique in the world and I am proud to be a South African when I talk about you and my beloved Tiger Canyons. 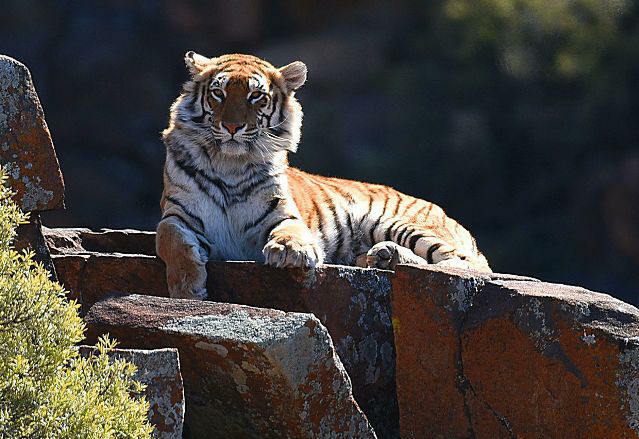 The Tigress Julie Lodge is an unforgettable experience. The hours spent just being with and observing the different wild tigers, will live in our memories for the rest of our lives. God bless you and your crew for many years to come. I really hope that I would be able to visit TC again ---- for the third time….